NEW YORK, NY – (September 12, 2013) – There are only TWO episodes left before the series finale of the iconic SHOWTIME drama series Dexter. Tomorrow night, the network will air a special trailer looking back at the 96 episodes that have preceded this momentous occasion. For a sneak peek, go here. 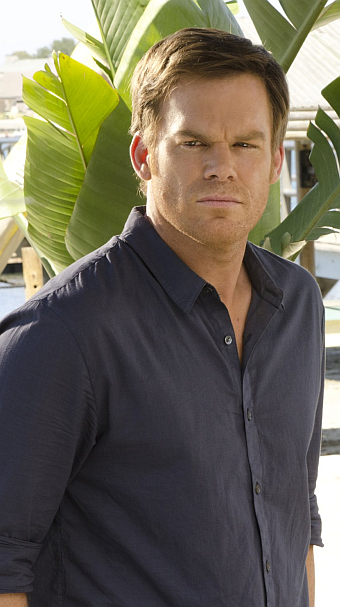 The penultimate episode of Dexter airs this Sunday, September 15 at 9 p.m. ET/PT only on SHOWTIME. The tension built up over ten episodes of Dexter’s final season will come to an explosive, shocking conclusion over the course of the next two episodes. As the pressure begins to mount on Dexter Morgan to escape Miami with Hannah and Harrison, as well as avenge Vogel’s death, will he choose his new found humanity or fall back to the ways of The Code? DEXTER stars Michael C. Hall in his Golden Globe® and Screen Actors Guild Award-winning role as Dexter Morgan, a complicated and conflicted blood-spatter expert for the Miami police department. Season 8 began six months after LaGuerta’s murder – with Dexter still managing life as a dad, brother, and serial killer. As Dexter and Deb (series star Jennifer Carpenter) begin to mend their fractured relationship, Dexter’s fugitive ex-girlfriend Hannah (special guest star Yvonne Strahovski) makes a surprise return to Miami. As the turmoil of Hannah’s return ensues, Dexter takes on a young psychopath protégé named Zach (guest star Sam Underwood), and starts teaching him the ways of The Code. Meanwhile, Dexter’s reconciliation with Hannah leads him to assist in her escape from the country, while Dr. Vogel (Charlotte Rampling) gets the surprise of a lifetime when a mysterious figure from her past returns. The series also stars Desmond Harrington, C.S. Lee, Aimee Garcia, David Zayas, Geoff Pierson and James Remar. Produced by SHOWTIME, DEXTER is executive produced by John Goldwyn, Sara Colleton, Scott Buck, Manny Coto, Tim Schlattmann, Wendy West, Jace Richdale and Michael C. Hall.